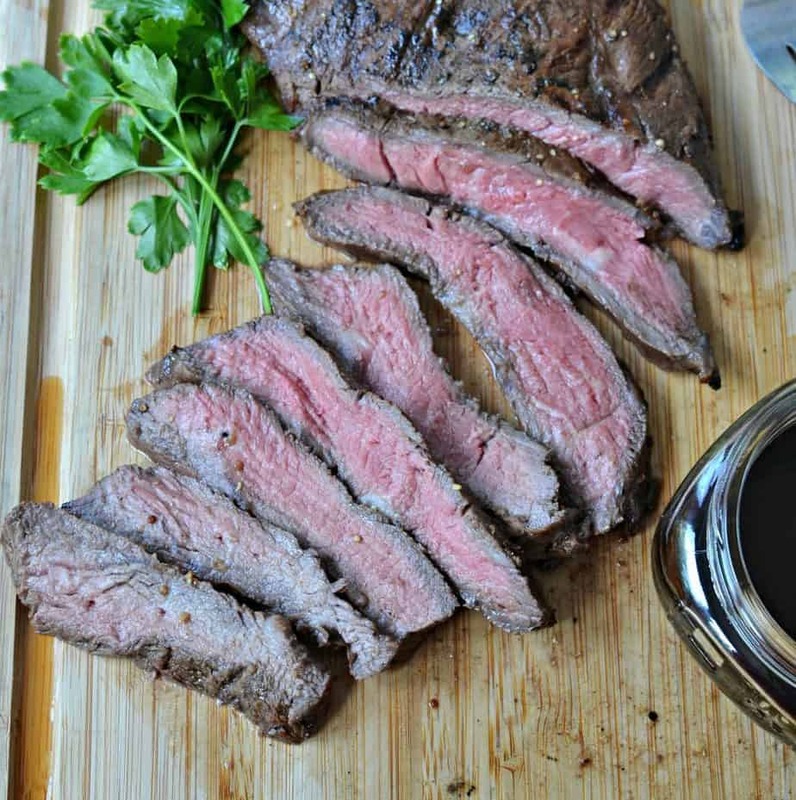 GRILLED FLANK STEAK IS TENDER BEEF STEAK MARINATED IN A BALSAMIC VINEGAR BASED MARINADE AND SEARED TO PERFECTION. IT IS PERFECT IN FAJITAS, ON A SPRING GREEN SALAD WITH BLEU CHEESE OR WITH A LOADED BAKED POTATO. 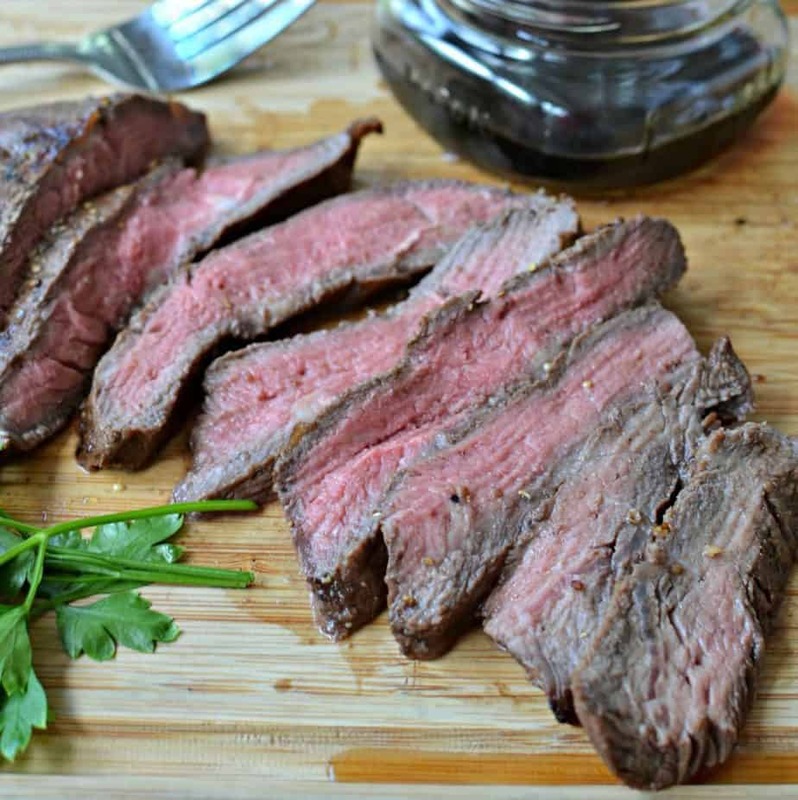 This is one of my favorite grilled beef recipes and it could not be any easier. 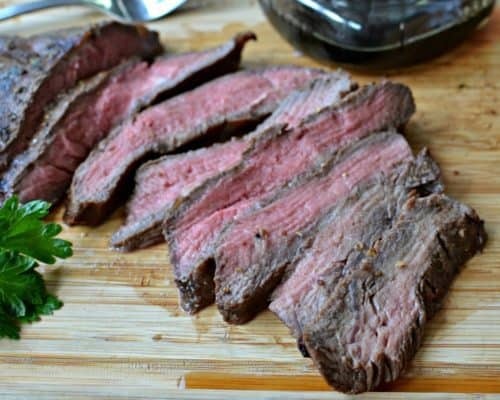 If you are any kind of a grill nut like me than you really need several good Grilled Flank Steak recipes. This is one of my favorites as it tenderizes the steak while giving it great flavor. The steak is best when allowed to marinate at least six hours therefore a little advanced preparation is needed. With grilled or sauteed onions and peppers wrapped in fresh tortillas or warm pita bread. Thinly sliced over a bed of fresh tortilla chips with tomatoes, red onions and melted queso. On a bed of fresh spring greens with avocado, corn, grape tomatoes, cucumber and bleu cheese. Right next to a big baked potato lathered with butter, sour cream and fresh chives. Great now I have managed to make myself hungry!! The best way to prepare flank steak is to marinate it for several hours. The star of this delicious marinade is balsamic vinegar. The addition of a little lime juice, brown sugar, garlic and a few other key ingredients help ensure that your flank steak is juicy, tender, and full of flavor. Just the thought of this delicious marinade makes my mouth water. Preheat gas or charcoal grill to high heat (around 450 degrees). Remove the steak from the marinade with tongs. Place on grill and cook 4-5 minutes each side. Do not disturb and do not turn more than once. You can watch for flare ups but if you preheated the grill than you really should not have any with flank steak. Once grilled the steak should be tented with aluminum foil and allowed to rest for 10-15 minutes. Using a serrated or sharp long knife slice against the grain at a sharp diagonal. Slicing across the grain instead of with it makes it more tender and easier to chew. Best way to check for your desired doneness is a meat thermometer. For rare it should register 125 degrees F, medium rare 130 degrees F, medium 140 degrees F, medium well 150 degrees F, well done 160 degrees F. Flank steak can get tough if cooked above medium so I do not recommend anything higher than that. 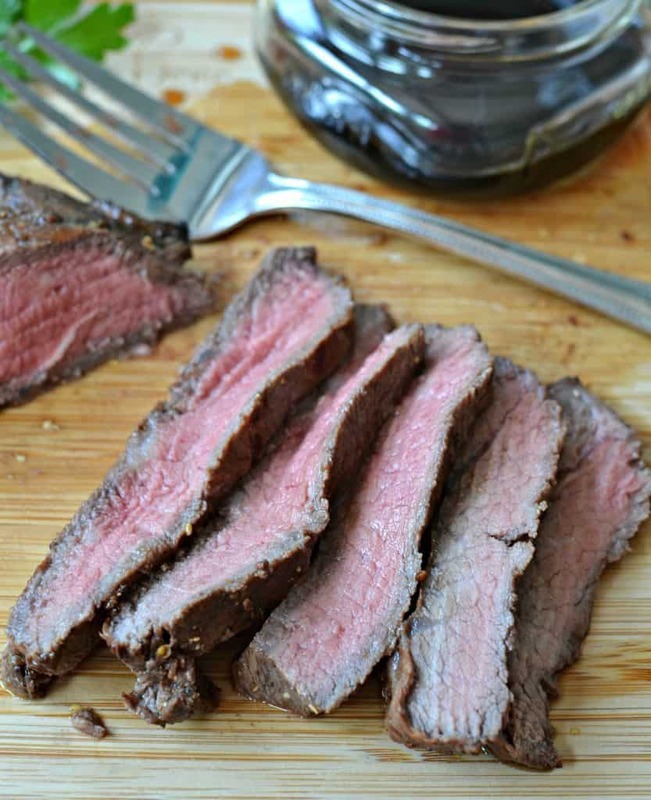 Grilled Flank Steak is amazingly easy and unbelievably delicious. 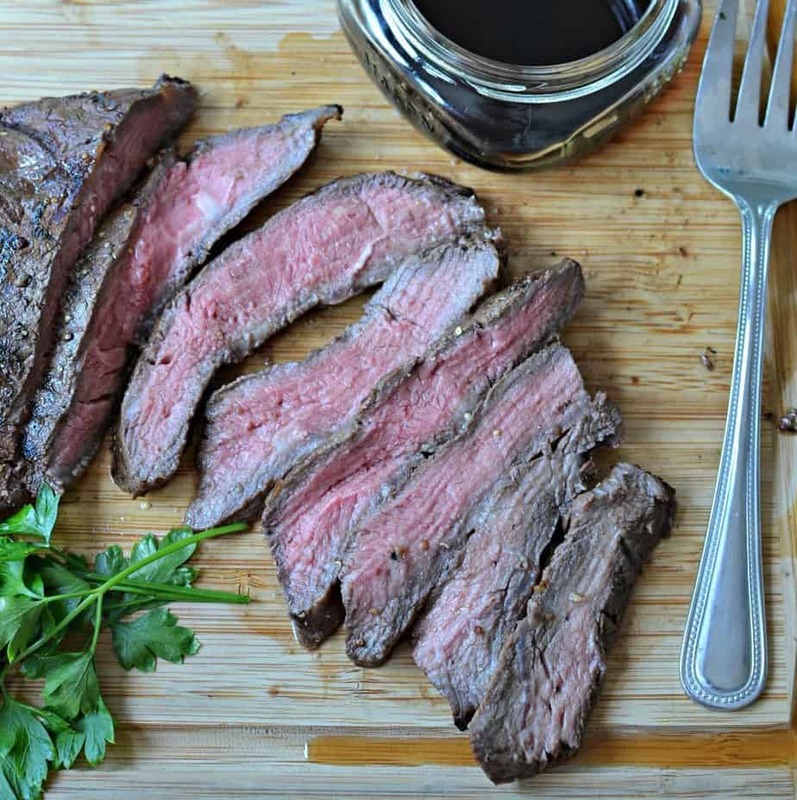 Grilled Flank Steak is tender beef steak marinated in a balsamic vinegar base and seared. It is perfect in fajitas or on a salad with bleu cheese. In large Ziploc bag combine vegetable oil, garlic, soy sauce, vinegar, Worcestershire Sauce, brown sugar, lime juice, mustard and black pepper. Add flank steak and marinade in the refrigerator from 6 hours to overnight. Turn several times. Preheat grill to high (around 450 degrees). Using tongs remove steak from marinade and place on grill. Discard leftover marinade. Cook 4-5 minutes; flip once and cook another 4-5 minutes or until desired doneness. Try not to disturb the steak and let it sear. Remove from grill and cover with aluminum foil tent. Let rest for 10-15 minutes. Using a serrated or sharp long knife slice against the grain at a sharp diagonal.